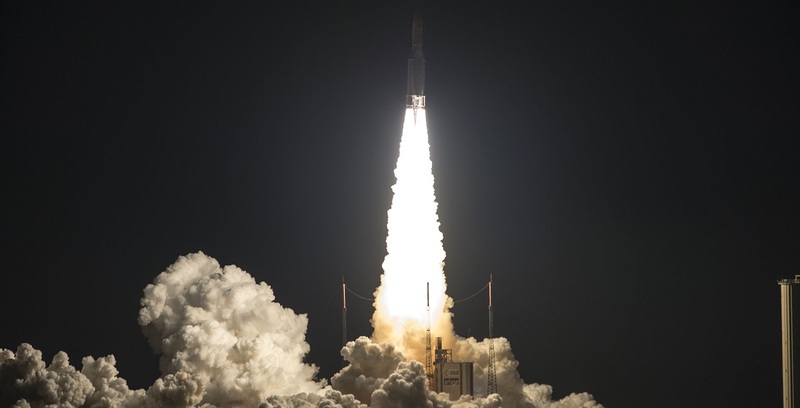 On its sixth successful launch during the first half of 2017, Arianespace set a new heavy-lift record Thursday with Ariane 5 in delivering the ViaSat-2 and EUTELSAT 172B telecommunications satellites to geostationary transfer orbit. The launch took place on June 1 at 8:45 pm (local time) from the Guiana Space Center (CSG), Europe’s Spaceport in Kourou, French Guiana. Thursday’s mission – designated Flight VA237 in Arianespace’s launcher family numbering system – keeps the company on track for the 12 flights targeted in 2017. It follows the five previous launches this year – two by Ariane 5, two by Soyuz and one by Vega – and clears the way for Arianespace’s next Ariane 5 mission, scheduled for June 28, along with three more Ariane 5 liftoffs and two Vega launches planned during the second half of 2017.